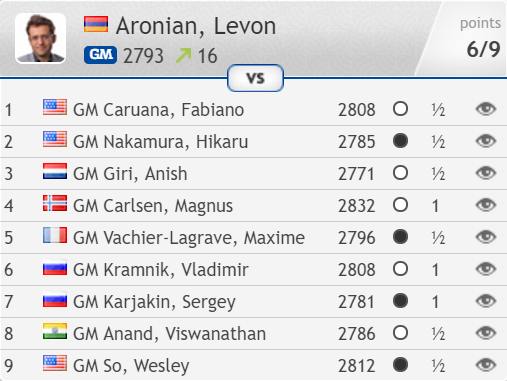 Levon Aronian has won one of the strongest tournaments of all time by a full point after his rivals fell at the final hurdle. 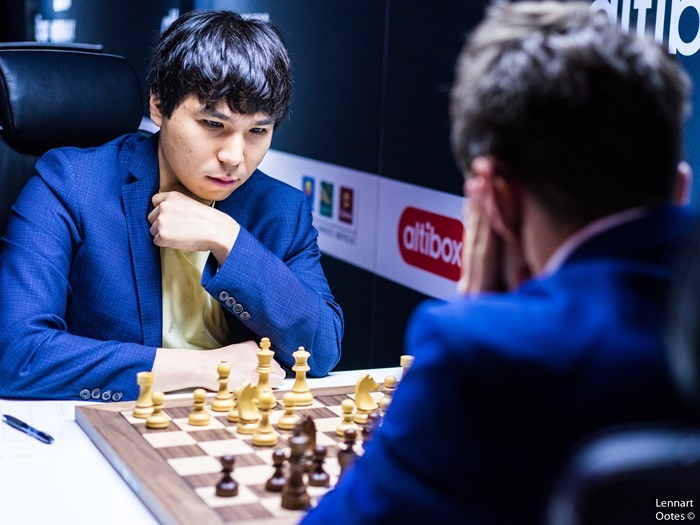 While Lev drew safely with Wesley So, Hikaru Nakamura was cut down in Fabiano Caruana’s Najdorf preparation, while Anish Giri’s attempt to punish Vladimir Kramnik’s bold opening play led only to a 20-move train crash that took their lifetime score to 7:0 in Vlad’s favour. 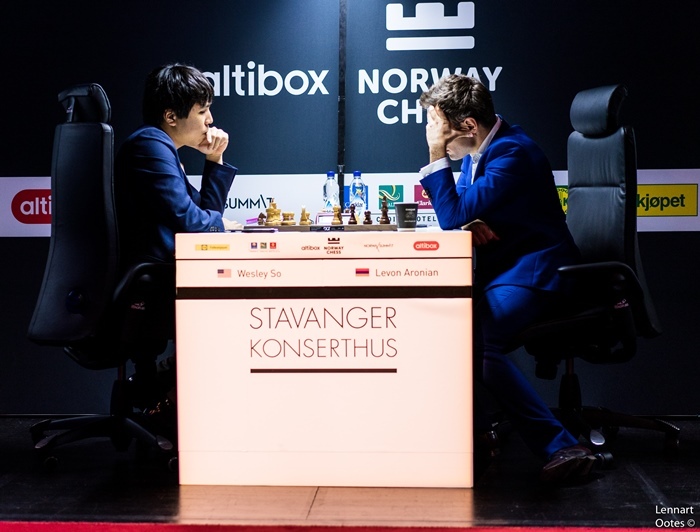 The other games were drawn, with Magnus Carlsen finishing 2nd last and revealing a staggering loss of confidence when he confessed, “I’m not so convinced about my ability to win games”. The only way I’m going to get equal first is if Fabiano gets a heart attack, which will not happen in the next 85 years, I hope! That draw woke me up – I realised I had to step up or I might lose on time otherwise. It is perhaps a serious point that the short time control of 100 minutes to the first time control on move 40, without increments, benefitted the players who could seize the initiative, which Levon did time and again with inventive preparation and play over the board. I never stopped thinking. The day I stop thinking about that I’ll probably quit, or it’s the day when I’ll finally become World Champion - one of the two! 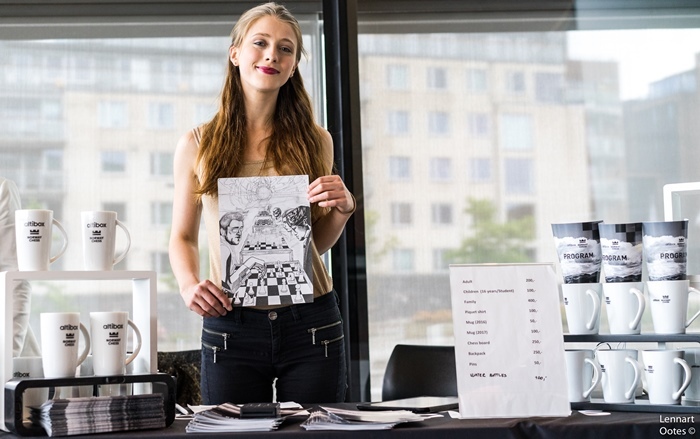 I respect myself so much: I’m my own favourite chess player! Such ebullience makes him many chess fans’ favourite as well, with the Garry Kasparov quote about the chess world being a better place when Levon is winning never feeling so apt. 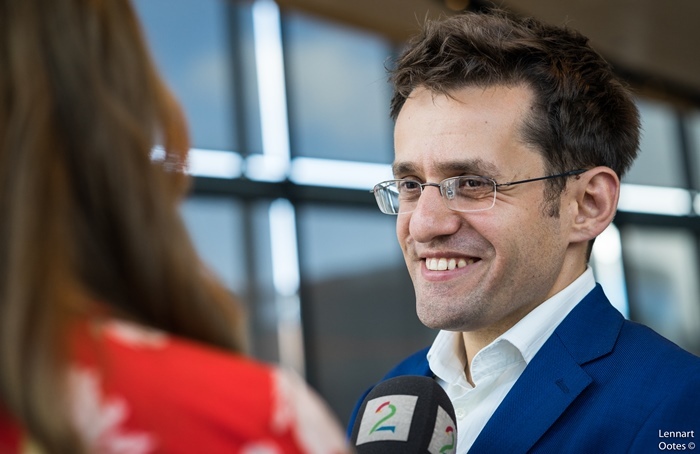 Aronian is back up above 2800 and into the world top 5 again, though the problem for his World Championship hopes is that he has no clear path to the Candidates Tournament. 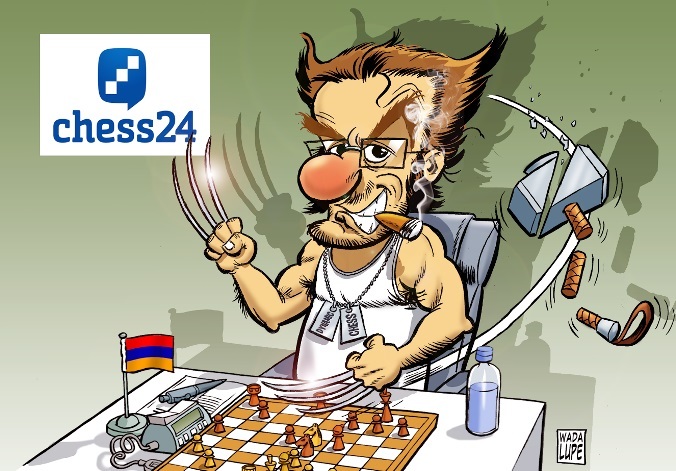 After a poor showing in the first Grand Prix he probably needs to get to the final of the World Cup, though Armenia again funding the Candidates in return for his participation also can’t be ruled out. It helps to be a national hero! In our preview of the tournament we asked “Is So currently the world’s best player?”, a question on which the jury is still out. 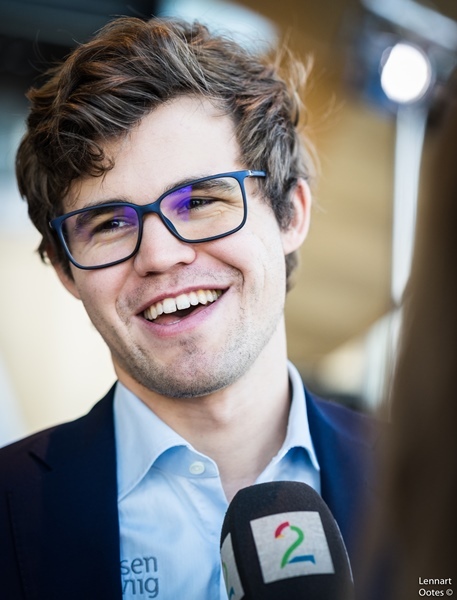 On the one hand we saw real evidence that Carlsen’s claim to that title is more shaky than it’s been in a decade, but after nine draws Wesley failed to make his own case – particularly with the older generation of Aronian and Kramnik turning on the style. 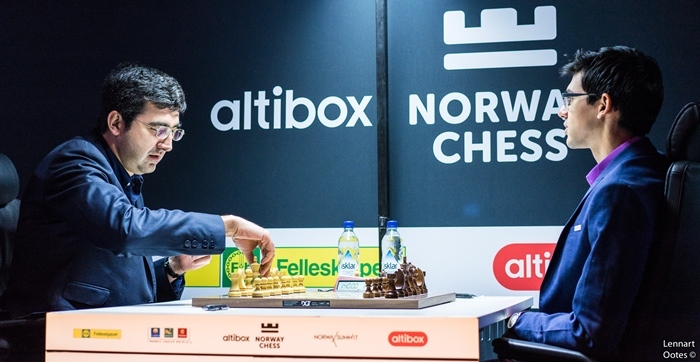 Of course drawing all your games so effortlessly against a field as strong as Altibox Norway Chess is no mean feat, especially given Wesley had five Blacks, but for once he couldn’t pull off his trick of squeezing out some wins from risk-free positions. Not Wesley’s event, but still more evidence that no-one would feel confident taking him on in a match. He would later comment, “Today I played terribly, but at least I felt ok”, though both players considered Black had compensation and the draw looked like a normal result. Obviously one doesn’t dream of minus 1… It was really a bad start, so under the circumstances, in this kind of tournament, it was a good recovery. I completely underestimated what Levon was doing in our game. When he sacrificed I thought it’s probably a bluff he’s prepared, but it’s a draw. My general hunch was that he had a repetition, but nothing more. Then I started to realise there were a bunch of problems with my position... At that point I thought I was completely fine and played a bit hastily and lost. I think it was just a lack of confidence from the start coupled with some very decent play from my opponents. That was just not a good combination at all. It was a strange feeling. Somehow I managed to build myself up at least a bit for each game, but then it would all disappear very quickly… Basically I know that I can play, but I’m not so convinced about my ability to win games. There won’t be some quick fix or anything. I have to work on it. Basically I think I can still play – I’m sure I can still play – I just have to get my confidence back. It has to be said that it’s a strong tournament and no-one can win it on demand, but usually even if I play poorly I’m in the upper half. Obviously that didn’t happen this time. Obviously I’ll speak to my closest confidants, but most of all I have to work on it on my own. I’m sure I’ll get there. It’s really connected to classical chess only. I’m very convinced I can do well in Paris! For a player whose game has always been based on seemingly unshakeable confidence those were some remarkable admissions. 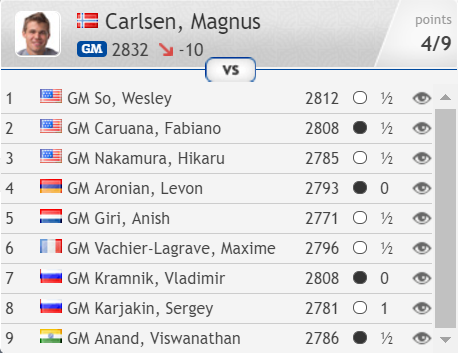 Anand pointed out when asked about Kramnik’s view that Carlsen needs to work on his openings that Magnus had always managed to get by with the belief that he can outplay his opponents from any position. 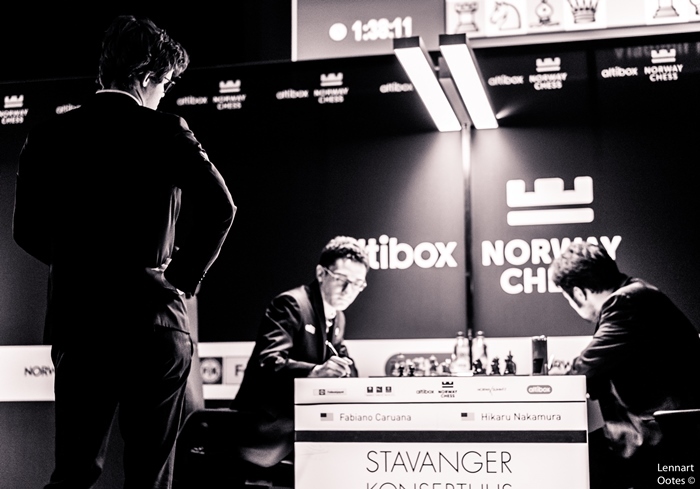 If he loses that belief, or even ability, we’re not far from a new era in chess history. But let’s not get ahead of ourselves… there are few who would be surprised to see a re-emergence of the old dominant Magnus in the near future. We’ve been brushing over the actual games so far, but this one is worth savouring. 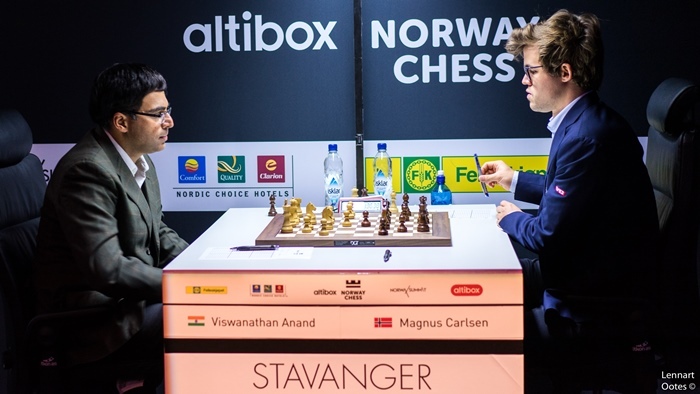 For Anish Giri to actually finish in first place he needed to win while Aronian lost, but even if that was a long shot he would still have loved to get a first classical win over Vladimir Kramnik. I just needed to finish my development and castle and I’m winning. 16.e4! unleashed the power of the previously trapped bishop on c1 at the cost of a mere pawn, and after 16…Nxe4 17.Bh6+ Ke7 18.f3 Nd2 19.Rfe1 Kd8 20.Bf4! Giri resigned. That took Vladimir’s lifetime score against Giri up to 7 wins and 0 losses, with 7 draws. When I played it I saw it, but I couldn’t play anymore. It was ridiculous. Instead of getting a better endgame with some chances I just got a worse position. Just a mental blackout. You remember I blundered mate-in-1 to a computer after 10 minutes’ thought! 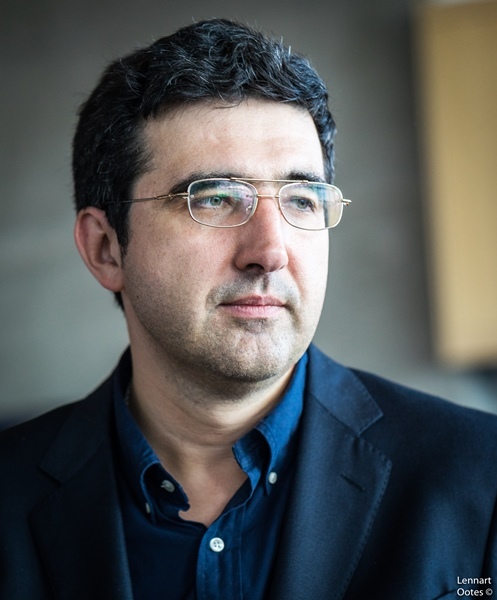 In the end Kramnik’s tournament was an exact replica of Shamkir Chess, where he also finished second with 3 wins and 2 losses, summing both events up as, “crazy losses, strange wins”. For the spectators it was of course great fun to watch - let’s hope Kramnik doesn’t retire anytime soon! It’s sometimes said that the best way to assess a tournament is by your position going into the final round. Whatever happens, if you go into the last day with chances of winning you must have done something right. That certainly applies here, since after a miserable blitz tournament and a first-round loss Anish was a revelation. He was getting the good positions he managed in the 2016 Candidates Tournament but actually converting some of them and in general showing a sharpness we haven’t seen from him in a long time. 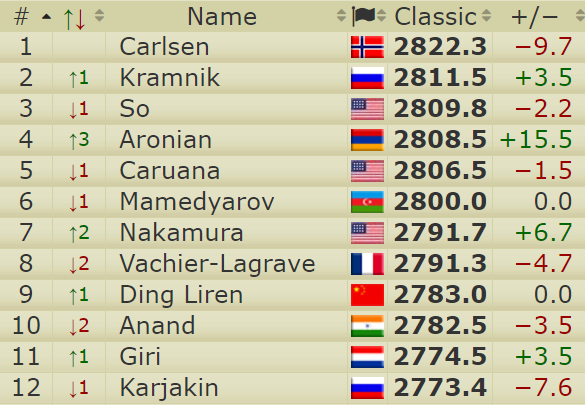 Perhaps the long attempt to grind down Fabiano Caruana in the penultimate round, or the memory of his previous losses to his nemesis Kramnik, affected him on the final day, but although the loss took away some of the sheen… and he scored his famous 50%... this was an excellent showing by the youngest and lowest rated player in the event. This game to some extent summed up the tournament for both players. Sergey Karjakin blundered and Maxime Vachier-Lagrave, despite getting in 20 moves of theory, then squandered the advantage almost immediately, admitting he hadn’t been “focussed enough” to realise his 24…Rxd5? didn’t work and that he should have played 24…f5! That was a theme of Maxime’s post-game press conferences, with the French no. 1 also admitting that in the game he won against Kramnik he’d become transfixed by Carlsen-Karjakin for a while. I’m very happy that the tournament is finished! 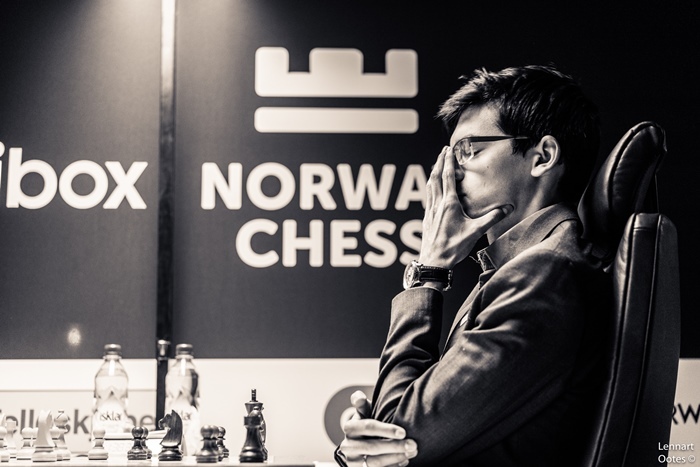 Maxime avoided Sergey’s fate with that penultimate round win over Vladimir Kramnik, though as we’ve already noted, it wasn’t entirely convincing. The Frenchman will look to show more when he plays in his “home” supertournament, the Paris Grand Chess Tour, starting in a few days’ time. He regretted he’s not quite as local as he was in the previous years, with the switch to a Canal+ studio venue meaning he now lives 10 rather than 2 kilometres from the venue. Life is tough! To play this move you basically have to see a detail way down the road that is very hard to spot… I was wondering for a while if he’d analysed it and was just trying to remember it. It’s so risky to play this without having analysed it. I couldn’t believe he’d calculated all the way up to here… I was thinking he’d prepared it, or he’d calculated it brilliantly – then he’d deserve a draw, or maybe even more than a draw! A little bit. He wasn’t thinking about this position, it’s clear. I think thinking for 30 minutes is not very good sportsmanship at this point. This sometimes happens when you play the Najdorf - otherwise it would just be the best opening in the world! Fabiano pointed out, “To play this you basically have to analyse every move for White or Black in every position”. Easy for him to say! The final game put a positive gloss on a tournament where previously Fabiano had been notable above all else for a catatonic approach to his play with the black pieces, defending miserable technical positions in game after game and earning the epithet of “accountant” from Giri. 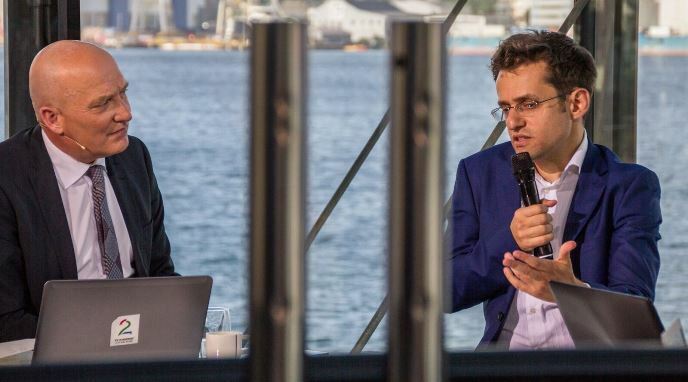 It worked to the extent that Caruana didn’t lose a game with Black – his one loss came with White against Anand – and perhaps it was a form of training for challenges ahead. The result kept Fabiano in the qualifying places for the Candidates Tournament by rating… just! The final game was of course a bitter end for Hikaru, but until that point he’d had an excellent tournament, racing into the lead with wins in Rounds 1 and 4 and staying there or thereabouts until the last round. The final decision to take on Fabi in the sharpest Najdorf couldn’t be criticised – the loss cost him €7,500 in comparison to finishing in sole 2nd place after a draw, while if he’d won the game and playoff he’d have earned €30,000 more. He’d also have climbed into the 2800 club while knocking Caruana out of it. It wasn’t to be, but the potential upside far outweighed the downside. 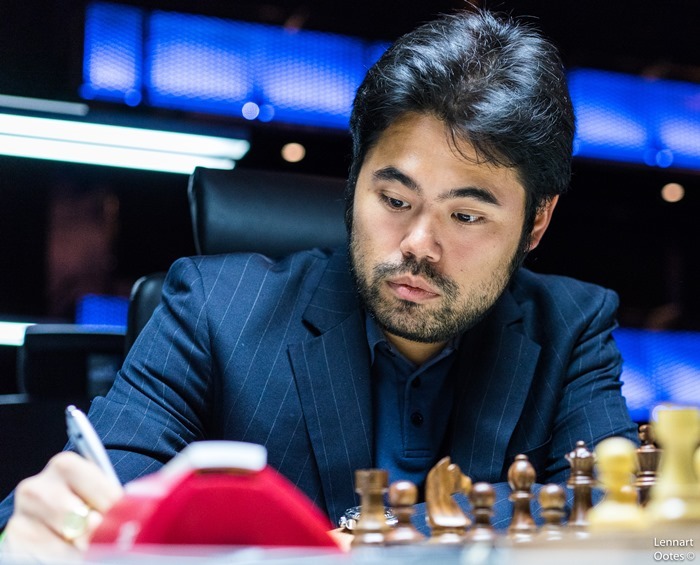 Then the Paris Grand Chess Tour rapid and blitz event starts on Wednesday, with a few familiar faces: Carlsen, Nakamura, So, MVL, Karjakin, Caruana, Grischuk, Mamedyarov, Topalov and Bacrot are all in action! 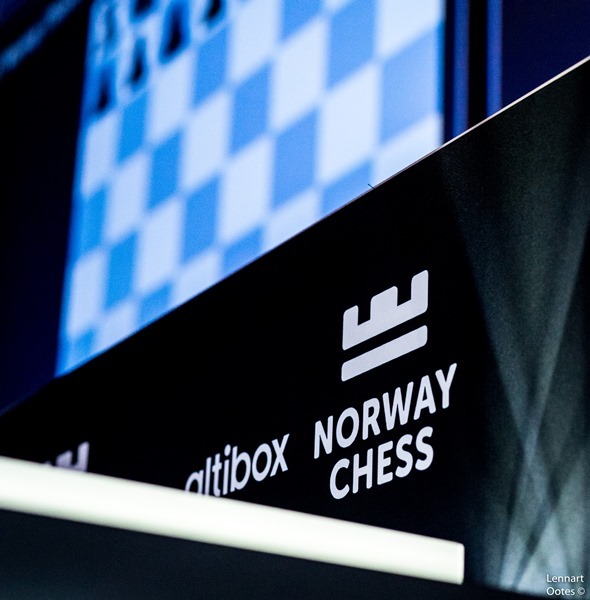 Altibox Norway Chess 8: Magnus (and MVL) are back!